All-in-one welder is an AC/DC stick welder, 11 KW generator, and it's quiet. Light, quiet and powerful describes the Hobart Welding Products Champion ELITE all-in-one AC generator and AC/DC stick welder. The exclusive engine placement creates more efficient airflow, reduces sound and eliminates heat recirculation. At just over 3 feet long and weighing only 490 pounds, its compact design offers powerful AC/DC stick welding capacity – 260 Amps AC/225 Amps DC – along with 11,000 watts of peak generator power. 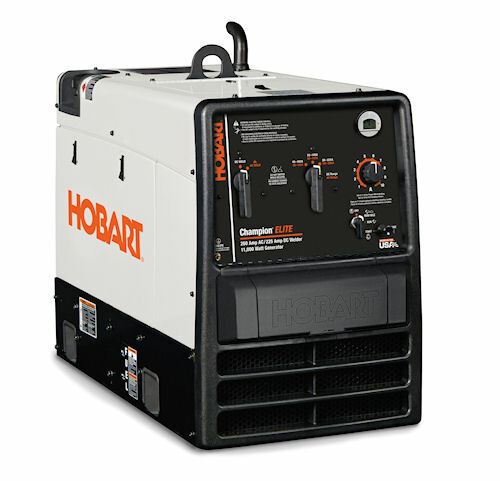 Hobart's Champion ELITE welder is quite and packs an AC/DC welding punch as well as 11 KW generator power. Hobart designed the unit for farm/ranch, general construction and emergency power applications or as a stand-alone generator. The unit provides strong and reliable generator power to run compressors, pumps, lights, hand tools and other equipment. It is also capable of producing power during welding so multiple users can work on tasks at the same time. The Champion ELITE features a covered receptacle package that includes (1) 6-50R 230V receptacle, (1) 14-50R 230V receptacle and (2) 115V 20A Duplex GFCI receptacles. Adding to its reliability, the Champion ELITE has a 12-gallon fuel tank, along with a Kohler 23 horsepower twin cylinder, 4-cycle OHV gasoline engine that was designed to conserve fuel and provide long run time. It also includes Hobart's Auto-Idle feature, which automatically idles the engine when not in use to provide greater fuel savings and reduce noise. Features like the unit's quick-set current control make it easier to use by providing faster set up for welding AC or DC stick, while a coarse and fine range amperage adjustment provides users with greater welding control.